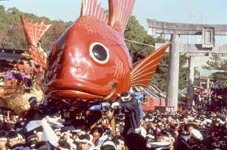 The Town Echoes with the Sound of Drums, Flutes, and Shouts as Huge Hikiyama Floats are Pulled through the Streets. Karatsu Kunchi is an autumn festival that takes place annually over 3 days from November 2 to 4 in Karatsu City, located in Saga Prefecture, Kyushu in the south western part of Japan. In 1980 the festival was designated an Important Intangible Folk Cultural Property. Karatsu Kunchi is an epic event in which local people, in time with rhythmical music, pull large floats through the town, to sound of flutes and drums, shouting the traditional prompting, "Enya! Enya!". Huge helmets or lions decorate the base of the floats, known as Hikiyama, which are 5 to 6 m (6 yd.) high and weigh from 2 to 5 tons. The basic structure of each Hikiyama is made from wood, and topped with a large decoration made from clay or wood over which, along with hundreds of sheets of washi paper, linen and other materials are laid. The surface is covered with different types of lacquer and finished with gold and silver leaf. It is said that each neighborhood spent enormous sums of money on the floats that took 2 to 3 years to complete. The 14 Hikiyama that are still used today were offered to Karatsu Shrine between 1819 and 1876. The first day of the festival is the eve event on November 2. A special mood prevails as the 14 Hikiyama, decked with paper lanterns, are pulled around the town. Lit by lanterns on an autumn evening, the Hikiyama create a magical scene. On the second day, with the portable shrine of Karatsu Shrine leading the way, the Hikiyama are pulled to Nishinohama, a sandy beach. The sight of people hauling the huge floats through the sand is an epic spectacle. On the third day, teams dressed in the traditional uniforms of Edo Period (1603-1868) firefighters pull the Hikiyama through their neighborhoods. This is the day on which these floats are returned to their storage building, the Hikiyama Float Exhibition Hall. Regretful that the festival has ended, the participants playact as they are reluctant to put their floats away and a sorrowful feeling fills the air. During the three days of the festival the whole town is in a festive mood. To welcome friends and relatives, rich food is laid out and drink flows freely. During the festival, no one is criticized for not observing good manners.